The arrival of spring brings more than warmer weather. The rising temperature demands a wardrobe change and ushers forth a new season in fashion trends. For those practicing, the Easter holidays are rapidly approaching, along with the challenge of finding an Easter gift. The flowers are beginning to bloom again, and as the color returns to the landscape, the scene is set for the spring wedding season. With so much sprung upon us, it’s easy to get a little overwhelmed. 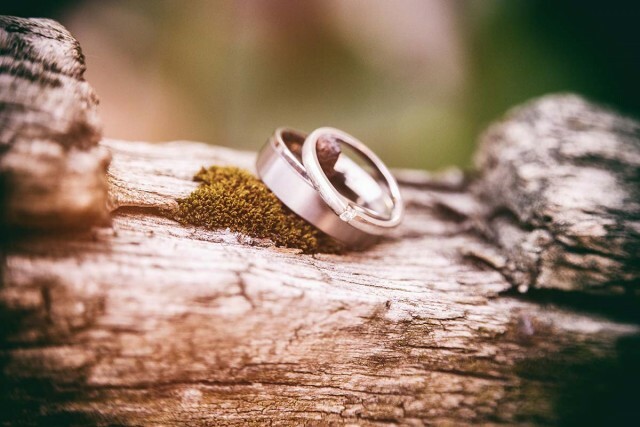 Fortunately, the strength of Titanium Style’s collection of titanium rings and titanium jewelry can help steady your needs for all of spring’s events. 2019’s rising fashion trends include dangling chain necklaces, gold-tone jewelry, and pearls. If fashion is your passion, our collection of titanium necklaces is perfect for staying on top of spring’s emerging trends. If you value the function of your accessories, our necklaces are lightweight, comfortable and chic, yet immensely durable. If your jewelry is worn for its form, then you’ll find that our wide variety of customizable designs makes it easy to find the perfect fit for your fashion statements. Fashion experts predict that yellow and rose gold jewelry will take a commanding presence in the 2019 jewelry scene and beyond. 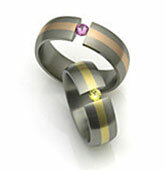 Our gold and titanium rings come in white, yellow, and rose gold accents and inlays, that will last for years to come. Not only will our titanium rings equip you with the strongest fashionable items on the market, but their hypoallergenic properties prevent irritation caused by other metallic jewelry. If gold and necklaces aren’t your styles, our titanium tension set pearl rings are just what you need to stand out from the crowd. Traditionally, tension set rings were reserved for only the hardest of stones, but our unique design makes it possible to set one of nature’s softest gems. 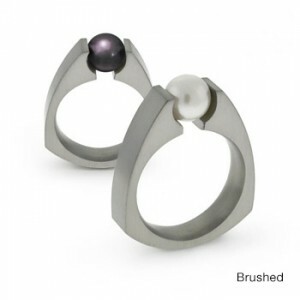 Available in White or Black, genuine Akoya Cultured Pearl, with a highly polished or satin finish, we’re confident that our pearl set titanium rings will make you (yes, I’m saying it) happy as a clam. Struggling to fill your Easter baskets this season? 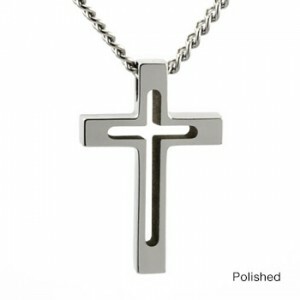 Titanium Style’s collection of cross imbued titanium rings, necklaces, and pendants are the perfect pieces for the Easter celebration. This series is extremely customizable and can be stone-set with natural or lab-grown gemstones, and feature a high polish or brush finish. If our clean, modern designs don’t fit your vision, we’ll help you create your own titanium cross ring, necklace, or pendant for your loved ones this Easter. 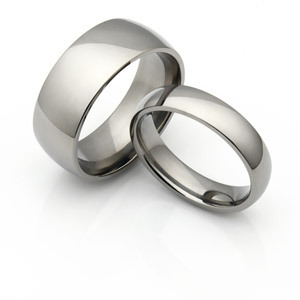 One of our specialties and most coveted projects is developing our titanium wedding rings and wedding bands. Nothing communicates your lasting commitment to one another like an indestructible titanium ring. Our wedding bands come in a wide variety of styles, finishes, engravings, and colors. If our existing designs don’t accurately convey your dedication to your partner, then our experts at Titanium Style are happy to help you craft the perfect ring. If it’s not yet time for a wedding band and you’re still searching for the right engagement ring, look no further than our collection of titanium engagement rings. Our stone set titanium tension rings combine practicality and tastefulness, a durable option for both men and women. Titanium engagement rings are more affordable than platinum rings, allowing for more customization. With a wide array of stone settings, precious metal combinations, and a lifetime warranty, make the strongest proposal possible with a titanium engagement ring from Titanium Style. With the arrival of spring comes more than just fair weather. In fact, many of the spring’s festivities require swift decision making. Whether it be updating your spring fashion accessories, buying a gift for the Easter Holiday, or selecting a wedding ring for you or your partner, bringing Titanium Style’s jewelry into your 2019 is a strong decision that you won’t regret. 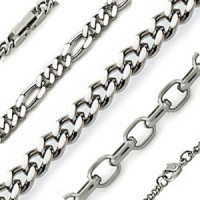 At Titanium Style, we believe that those considering buying titanium and tungsten jewelry are interested in these metals because of their light weight, corrosion resistance, and strength. These unique characteristics, together with the superior materials and workmanship, allow us to provide the highest quality products. For more information on Titanium Style and our lines of Titanium Jewelry, follow us on social media, check out our YouTube channel, and visit our other blog posts to stay updated on our educational content. For specific questions or concerns, contact us by phone at 1 (513) 520 – 0527 or email us at sales@titaniumstyle.com.